I Don’t Belong in a Nursing Home. I have places to go. Things to do. People to meet. With the stroke of a pen, Teresa Pocock’s human right to decide where she lives was wrongly taken away. 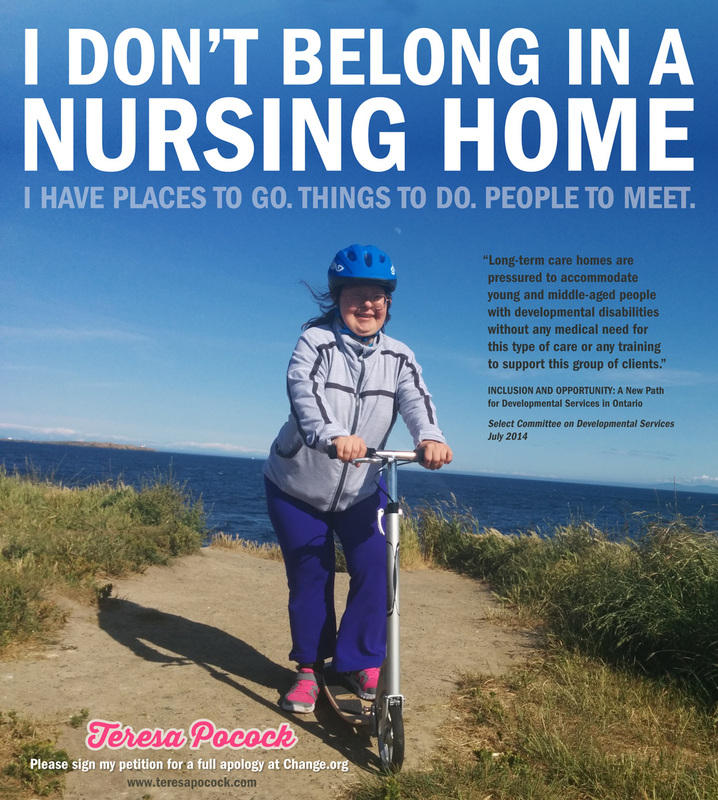 In a heart-breaking move, Teresa, my sister-in-law who has Down syndrome, was forced against her will into an old-age nursing home, by the Toronto Central CCAC (Community Care Access Centre) and two of my siblings. Four days later, she was rescued by my 91-year old father who was “adamant” he did not want his daughter living in a nursing home. But then the nursing home called the police, in a shockingly callous and bizarre effort to force her back. By signing this petition you can help Teresa get an apology for the harm done to her. Teresa is asking the CCAC to apologize for wrongly taking away her human right to decide where she lives. Teresa is asking the Rekai Centre to apologize for calling the police in a completely unnecessary, intimidating and callous attempt to force her back into their institution. Over three months ago we filed a 12-page complaint with the Ontario Ministry of Health. We have only heard they are “inspecting” the matter. We need a full apology from both institutions because this is not just about one person — it’s about standing up for and protecting the human rights of all people with disabilities. Please sign Teresa Pocock’s petition demanding an apology from the CCAC and Rekai Centre at Change.org.